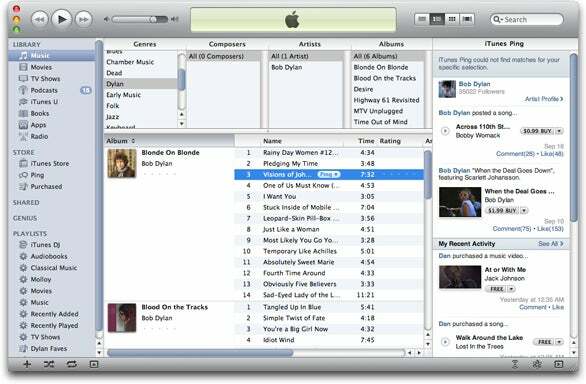 On Friday Apple released iTunes 10.0.1, fixing a few bugs, but above all updating the Ping musical social network introduced in iTunes 10. But the biggest change in this update is the addition of a Ping sidebar in iTunes. Taking the place of the previous Genius sidebar, the Ping sidebar is designed to offer constant access to Ping information, with real-time updates. To display this sidebar, click the little sidebar button at the bottom-right of the iTunes window, or choose View -> Show Ping Sidebar. This menu command has the same keyboard shortcut as the now defunct Genius sidebar: Command-Shift-G. When you display the Ping sidebar, you’ll see recent activity from friends and artists you follow. If you select a song, you’ll see additional information: in some cases, the song or album will display at the top of the sidebar; in others you’ll see information about the artist and posts they have made. Here's what I see when I select a Bob Dylan track in my library. Ping’s incursion into your iTunes library goes much deeper, though. You will notice that when you select a track, or when a track is playing, there is a new Ping pop-up button next to that track’s name. From the Ping button next to tracks, you can access a number of Ping functions. Apple has made these changes because it was too complicated to ‘like’ or post about your music with Ping’s initial iteration: you had to find that music on the iTunes Store first, then like or post about it. Here's what you can do when you click the Ping button. Now you can perform these actions from anywhere in your iTunes library or from a playlist. For example, choose Post and an iTunes dialog box displays where you can add your comments. You still can’t post about music that is not in the iTunes Store. If you run this command, and relaunch iTunes, the buttons will be gone. You will still, however, be able to access Ping’s features when selecting a song by control- or right-clicking on it. Just choose Like, Post or Show Artist Profile from the contextual menu. So Ping is trying harder to get you interested, but for those who don’t want to use Ping, there is still no way to totally remove it from the Store section of the iTunes sidebar. If you want to use Ping, these changes make doing so easier. If you don’t, however, the presence of the Ping buttons may annoy you. It would have been nice if Apple had included a preference to remove them.